On a trip to Baku to celebrate Turkish-Azerbaijani ties, Turkish President Recep Tayyip Erdoğan reiterated his opposition to normalizing relations with Armenia, saying Yerevan must first withdraw from a breakaway region that is claimed by Azerbaijan. Nagorno-Karabakh, which is populated by ethnic Armenians, declared independence from Azerbaijan in 1994 after a six-year war that killed some 30,000 people and displaced more than 600,000 Azerbaijanis. The international community recognizes the mountainous enclave as part of Azerbaijan. Turkey broke off diplomatic ties with Armenia and has kept the border closed since the war to protest the occupation of Nagorno-Karabakh. 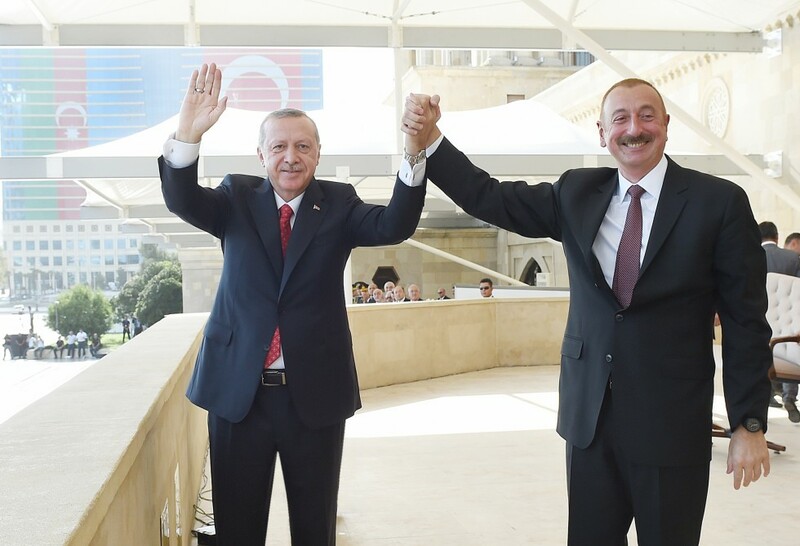 Turkey and Azerbaijan, meanwhile, enjoy close economic and military ties, as well as a sense of ethnic kinship. “Those who occupy 20 percent of our brother [Azerbaijan’s] territory, who prevent [people] from returning to their homeland, are waiting in vain for us to open our borders. The occupiers must take the first step in this matter,” Erdoğan said during a visit to Baku on Sept. 15. “Nagorno-Karabakh, the biggest source of problem for Azerbaijan, is as big a source of problem for us as well. As Turkey, we will continue to support the efforts of Azerbaijan to resolve the problem,” Erdoğan also said in a Twitter post from his official account. Erdoğan spoke at a military parade in Baku, where he was the guest of honor at celebrations for the centennial of the liberation of Baku by Turkish Ottoman forces on September 15, 1918. Erdoğan’s late arrival in Baku delayed the start of the parade by six hours, local media reported. The date has become an unofficial holiday in Azerbaijan to highlight its alliance with Turkey and is part of wider commemorations this year of the 100th anniversary of the founding of the Azerbaijan Democratic Republic, one of the world’s first Muslim republics, which survived for just two years before the Soviet army reconquered the territory. Azerbaijan’s approach to the centennial of the First Republic has been complicated, with its current strongman leader Ilham Aliyev perhaps aware that his own democratic record pales in comparison to the earlier republic’s progressive credentials, which included giving women the right to vote. The Ottoman army’s role in liberating Baku “is a special occasion in our history and de facto establishment of the Azerbaijani Democratic Republic in Baku. So the help of Ottoman Army … in this case is undeniable,” said Altay Goyushov, an Azerbaijani historian. But the current government's approach to the history of the first Republic is selective, and the current celebration of the Ottoman role overlooks Turkey's subsequent betrayal, Goyushov added. “In 1920, the alliance of Mustafa Kemal's Turkey with Soviet Russia was one of the main reasons why the First Republic fell and was occupied by Bolsheviks. The building of different history than the reality actually happens in this particular case when the majority still does not want to hear about the crucially negative role of Kemal’s Turkey … in the occupation of the Azerbaijani Democratic Republic by Soviet Russia," Goyushov told Eurasianet. Nowhere is the alliance in sharper relief that in Turkey’s stance toward Armenia, with which it shares a history of animosity that goes beyond the conflict with Azerbaijan. Despite broad consensus among historians, Turkey denies claims that 1.5 million Armenians perished in a genocide in Turkish lands during World War I.
Armenia earlier this year officially dropped a set of long-stalled protocols with Turkey brokered by the United States in 2009 that devised a process for the two countries to restore relations. Erdoğan had all but killed the protocols soon after they were signed, demanding that Yerevan first withdraw from Nagorno-Karabakh. In a separate development, the lack of diplomatic relations between the two neighbors has exacerbated the plight of a 16-year-old Turkish high school student who has been held in Armenia since late July after he crossed the border while herding sheep. Despite contacts by Turkey’s embassy in Georgia and Turkish police with their Armenian counterparts, Ozmen remains in custody in a juvenile detention center outside of Yerevan, news site T24 said. Now, Erdoğan has intervened, phoning Pashinyan to request his help in securing Ozmen’s release, newspapers said over the weekend. Ozmen’s family expects him to return early this week. However, Armenian media reported that Pashinyan denied the call even took place. Ayla Jean Yackley is a journalist based in Istanbul.